Was it just happenstance that George Johnston was the first seaman in his extended family? His parents Alexander Johnston and Margaret Lyle of Glasgow arrived in Launceston on the Storm Cloud in 1855 after a voyage of 71 days in the stormiest seas of the world, and George was born only a few weeks later on 15 September 1855. He had 12 close uncles and aunts and almost 40 first cousins in Scotland but it was only his younger brother Alexander and Alexander’s descendants who shared George’s love of the sea. A number of letters which George wrote to his family in Tasmania have survived and show that he spent many years on cargo and passenger boats, both sail and steam, plying between the Far East, UK, the Americas and Australasia. He had a firm clear handwriting and was of a literary turn of mind. It is not certain when George first went to sea. There is a letter from him dated 5 September (no year given) from the Hawkesbury in Sydney, about to leave for Shanghai. George described it as a “flash trader”. ‘The Times’ shipping records show that the Hawkesbury, a Devitt & Moore clipper packet , did a regular run between London and Sydney; a voyage in 1874 arrived in Gravesend on 2 Jan from Sydney and departed again on 29 Feb 1874. Perhaps George was on this voyage. He would have been nineteen. By July 1874 George was writing to his family from the other side of the world on board the Wimmera, a celebrated Aberdeen clipper and large passenger and cargo ship of 1008 tons, Lloyds class A1. She was sailing somewhere north east of the (River) Plate, which forms part of the border between Argentina and Uruguay on the SE coastline of South America, a famous nautical area visited by Sir Francis Drake in early 1578 and where the German warship Admiral Graf Spee was scuttled after fighting Allied warships in WW2.. They ‘spoke’ (met at sea) another ship which would have delivered George’s letter at its next port of call. The Wimmera had previously sailed from Calcutta on 13 Jan 1874 presumably to South America and then back ‘home’ (England) where it was reported anchored in the River from Deal on 17 Oct 1874, bound for Port Phillip and Geelong in Victoria. I am, Dearest Mother, Your Sailor Boy George. “I leave tomorrow morning or Sunday not sure which, but I have to go aboard in the morning. I was nearly losing the chance but the Captain behaved very decently to me and signed me. … I was going down yesterday but Maggie said she was going for a walk so I went with her and did not go to the dock. Tonight there is a party at our house so I made up my mind to stay in today and was going tomorrow Saturday the 6th to see when the Captain was to sign hands. He told me a week ago that he would leave here on the 10th and so sign on the 8th. But something turned up and he signed on the 4th. Luckily he did not remain on the Loch Ard much longer, as seven months later she was wrecked on 1st June 1878 near Curdies Inlet, 27 miles west from Cape Otway on voyage from London to Melbourne, with the loss of 52 lives of the 54 passengers and crew aboard. 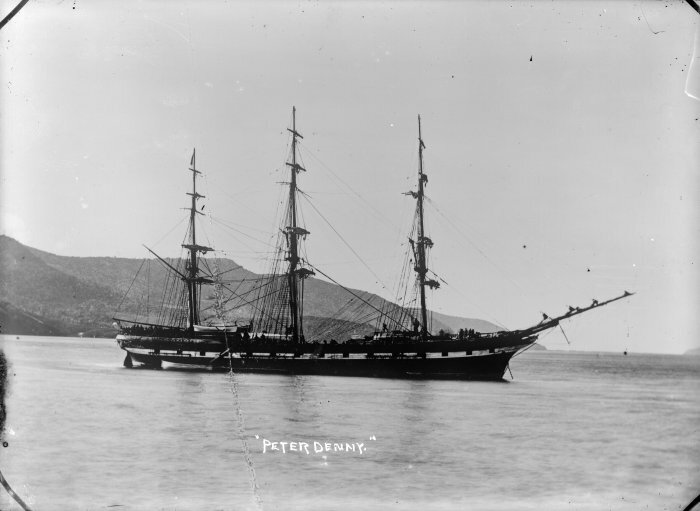 In a later letter George mentioned having “run away” from this ship in Melbourne – more likely he signed off, or he would not have been able to claim sea time towards his mate’s ticket. From then on it is not known which ships he sailed on, but he continued to write home at intervals. On 29 May 1878, writing from Glasgow, he called himself a ‘cocoethes scribendi’. He was previously in Greenock for 10 days –”a fine town”. Next voyage was to be to the Mediterranean and New York – a 3 month round trip. He said had written to the Registrar-General of Seamen – he was 6 weeks short of the required 4 years (for a mate’s ticket?). Another letter undated but probably late 1878 mentioned how Glasgow is changing. George was to sit his final seaman’s exam in Glasgow in July. He gave his Uncle George’s full address in Glasgow and said that Uncle Peter lived near the Necropolis and was preaching. (Thus providing wonderful corroboration for the author’s research using Census records – the surname Johnston being rather common in Glasgow!). It is not known what happened to George in the next five years. He obtained his First Mate’s ticket on 25 October 1883 in London (what happened in Glasgow?). Perhaps he decided he was tired of sailing the world and wanted to be closer to home and his family, for whom he obviously had much affection. George’s eldest brother was by that time living in Sydney. Possibly George was one of the crew of the steamer Cahors on her maiden voyage to Australia in 1884 and decided to stay with her when she became an interstate coastal steamer. The SS Cahors was a powerful screw steamer of 550 tonnage register and of 1200 tons gross, built in England in 1883. She carried about 200 passengers and cargo between Melbourne, Sydney and Brisbane, making several record-breaking runs. About 1884 George became the second officer. No doubt George’s family were happy to know he was closer to home and no longer subject to the perils of the open sea. But on 15 June 1885 the family received terrible news. Shipwreck! The steamer Cahors, from Sydney to Brisbane, ran on Evans’ Reef, 13 miles south of Richmond Heads, at 6 pm on Wednesday, while going at a rate of 14 knots per hour (sic). After continuous signally, the steamer Burwah, also bound to Brisbane, came up at midnight. She immediately lowered boats, and commenced transhipping the passengers from the Cahors which was accomplished with difficulty…. The steamer Tomki also stayed by the Cahors for some hours today, and succeeded in rescuing a horse which was swimming about. … there is little or no hope of the vessel being recovered, the water in the hold and engine-room being at tide level. Captain Walker and the officers and crew still stay by her. The Illustrated Sydney News Volume 22, No. 7, 1885 published a “highly interesting narrative ….. supplied by a gentleman who was a passenger on the Burwah”, accompanied by the large half page pen-and-ink illustration (below). Interestingly, it was not ‘women and children first’, because it was still dark. “The men were let down by means of ropes into the sea, and were then picked up by the lifeboat”. Ladies and children were taken off in a coal basket, as reported in the SMH, but “… even this was not unattended with danger, owing to the heavy surf waves. 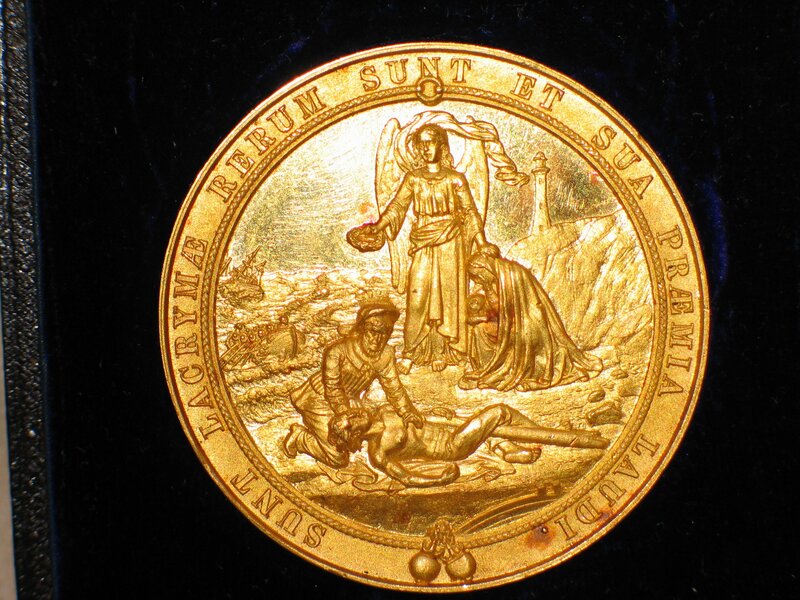 One lady was ducked under water three times before the men were able to haul her into their boat”. The wreck occasioned a great deal of interest, the Sydney Morning Herald carrying the news story for many days. It was also the subject of several Editorials particularly when George’s death became known. 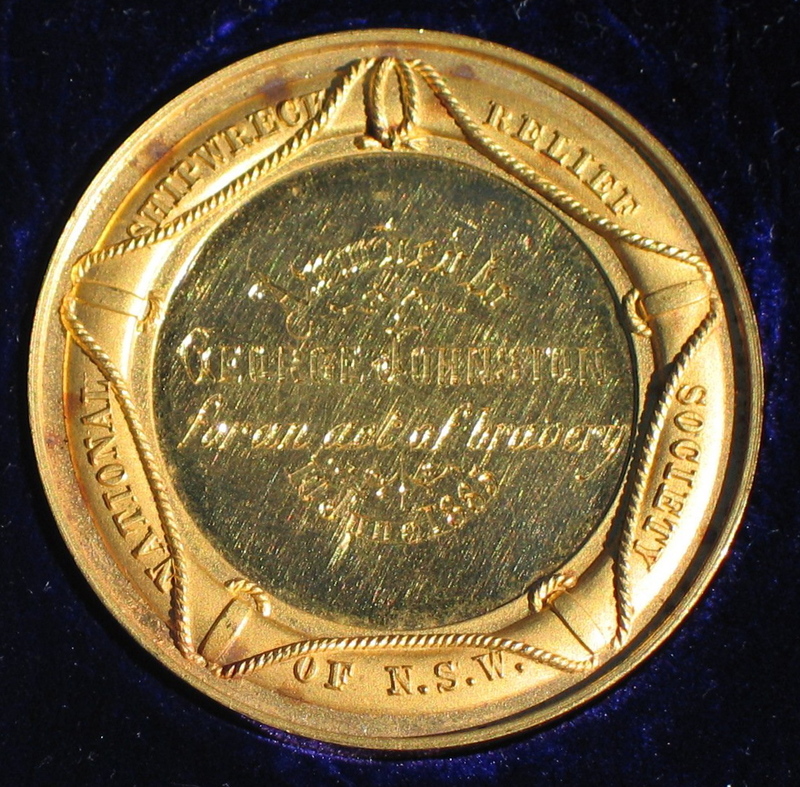 It was a great joy to the author when she discovered the medal and letters are now in the possession of the descendants of George’s brother Charles. 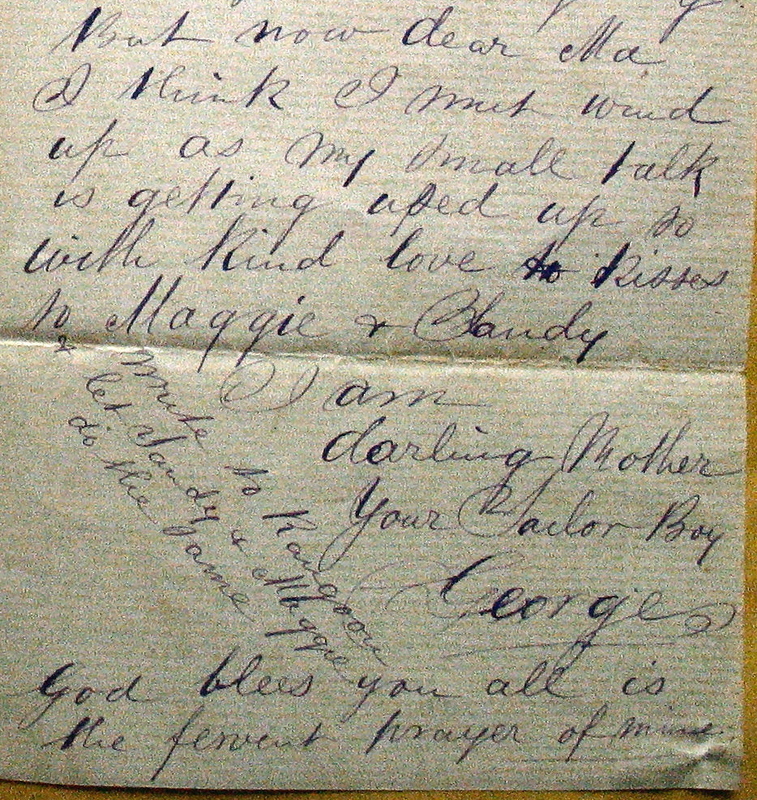 The letters not only made it possible to piece together some of George’s travels, but gave independent corroboration that the extended Glasgow Johnston family has been correctly identified. (c) 2015 Nancy Vada Gibb.